WASHINGTON (CN) – Midterm elections are a little under a month away and according to outgoing House Speaker Paul Ryan, the contentious battle to confirm Supreme Court Justice Brett Kavanaugh has electrified the Republican base. 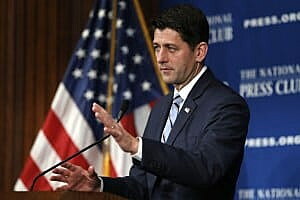 Ryan delivered a speech at the National Press Club in Washington, D.C. Monday evening and told reporters that in his travels around the country in the last few days, he’s noticed Republicans are “very animated” and more “activated” than ever before. Ryan was largely out of the spotlight during Kavanaugh’s nomination process. The process, he said, is purely a Senate endeavor, giving him little reason to engage with Senate Majority Leader Mitch McConnell, R-Kentucky, after the testimony of Dr. Christine Blasey Ford. Ford testified that Kavanaugh sexually assaulted her when they were teenagers; Kavanaugh fervently denied the allegations. Though mum on interactions with McConnell, Ryan heaped praise on another senator: Sen. Susan Collins, R-Maine. Collins used both the “right analysis” and “right tone” in a “tremendous” speech she delivered on Oct. 5 supporting Kavanaugh’s nomination. Aside from Kavanaugh, Ryan also spoke at length about the “accomplishments and achievements” he feels the GOP has amassed since President Donald Trump took office: securing major funding for U.S. defense, “overhauling” the Department of Veterans Affairs and passing sweeping tax reform in just seven weeks. Ryan also weighed in on Medicare for All. The legislation – which was first introduced by Independent Sen. Bernie Sanders of Vermont over three years ago – has received an increasingly warm reception of late from Senate Democrats eager to retake Congress in the upcoming election. Expectedly, this push for single-payer health insurance is a mistake, Ryan said Monday. “Even after the failures of Obamacare, this is still the direction the left wants to take our country: fewer choices, if any choice, all while having the government control this huge part of our lives, this personal thing for us…single payer is a bad idea,” he said. During a Q & A session following his remarks, Ryan moved from economy to climate. Weighing a recent report by the United Nations suggesting the earth is warming faster than anticipated and catastrophic impact could come as soon as 2030, Ryan played down questions focusing on the administration’s push to roll back environmental regulations at the Environmental Protection Agency and elsewhere in federal government. The answer to combating climate change is “better tech,” Ryan said. Ryan also considered the persistence of bitter partisan battles regularly unfolding on the national political stage. “It fuels tribalism and identity politics. As conservatives we abhor it,” he said. “That’s a bill, that’s an idea. I rather have rigorous debate on ideas and talk about an uplifting inclusive agenda,” Ryan said. But Ryan’s own super-PAC, the Congressional Leadership Fund, has relied on identity politics and tribalism to shore up its voters ahead of the 2018 midterms. In Virginia, the super-PAC ran attack ads heavy with those sentiments when targeting Abigail Spanberger, a democrat running for a House seat in the state’s 7th district. Spanberger was once a teacher at a Saudi embassy school just outside of Washington, D.C. but in the Congressional Leadership Fund’s attack ad, her professional experience as a CIA operative combating international and domestic terrorism was wholly omitted.